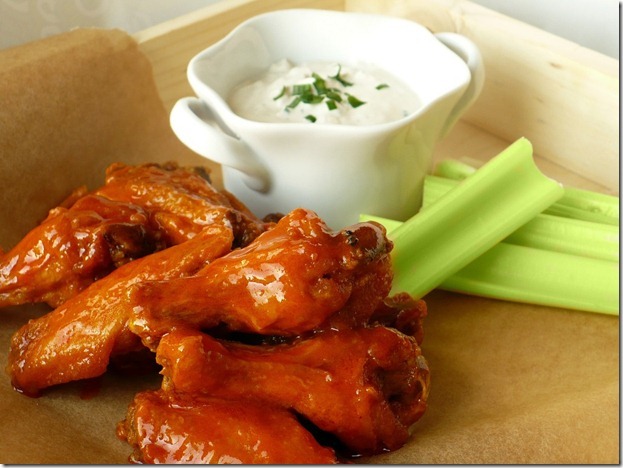 Here is the famous recipe for New York Buffalo wings with cream cheese dip by Chef Tahir. First of all heat the oil to 375 degrees Fahrenheit, or 190 degrees Celsius. While your oil is heating, take out a small saucepan, and add into it the unsalted butter, hot sauce, coarse ground black pepper, and garlic powder. Heat these ingredients over low heat, stirring until the sauce is even and thick. Once the sauce is done, remove it from the burner, and set it aside. In a big mixing bowl, sift together the white all purpose baking flour, hot ( red chili powder) cayenne pepper, and salt. And evenly coat your chicken wings in breading base, and then set them in a dish. Place the dish into the refrigerator, and let the breaded chicken chill for at least one hour. Once chilled, fry your chicken in the hot oil for roughly 15 minutes, or until the chicken is crisp and golden. After your chicken is cooked, coat each wing in the hot sauce mixture and served with cheese dip. Beat all ingredients in small mixing bowl at medium speed with electric mixer until well blended. You can also serve this dip with French fries and with steaks.